Legos rule - it's a fact that everyone is well aware of. Legos scattered all over the floor and stepping on them, especially barefoot in the middle of the night...not as cool. Transporting Legos to the restaurant, for play dates, and road trips...also quite the drag. This wooden tray solves all of those problems. 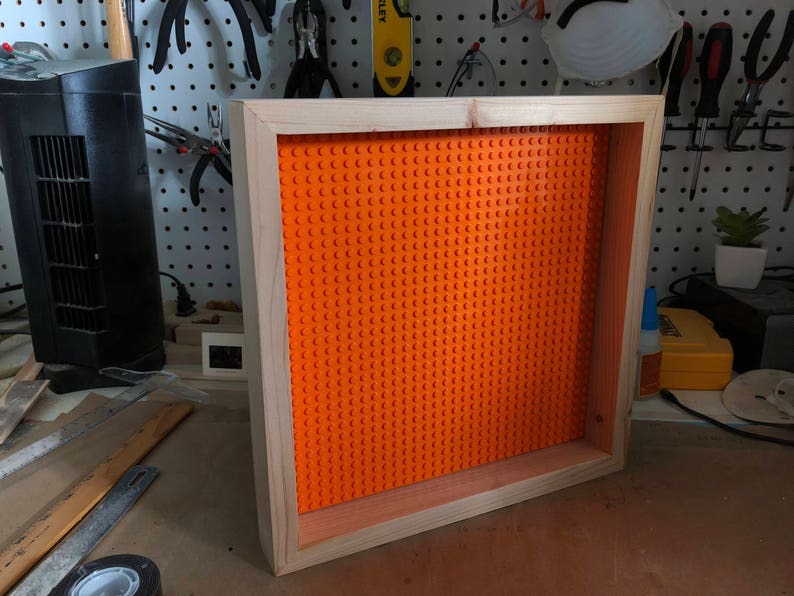 The 10" x 10" Lego plate (entire tray measures 12" x 12") is adhered to a firm backing with industrial strength adhesive to ensure that the Lego plate won't go anywhere and is surrounded on all sides with wood sanded smooth and treated with a coat of water-based polycrylic. Also great for displaying your kid's Lego artwork on the wall or a photograph in a unique way. Just attach a sawtooth hanger on the back and you're good to go - hang anywhere.